Bus from Kuala Lumpur to Pasir Gudang is the most convenient direct transport service. With this direct service from KL to Pasir Gudang, passengers do not need to have a transit in Johor Bahru Larkin Bus Terminal like last time. Thus, passengers save time by taking direct bus from KL Terminal Bersepadu Selatan to Pasir Gudang. 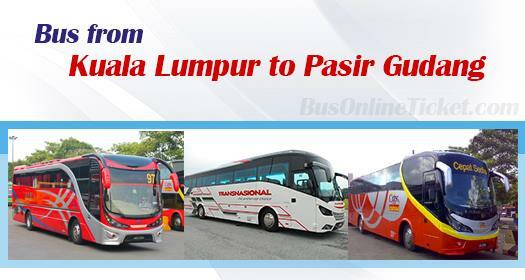 Transnasional, Maju Express and City Holiday are the few reputable and reliable bus operators that provide bus from Kuala Lumpur to Pasir Gudang. Transnasional is the leader in the express bus industry and they almost cover all bus routes in Malaysia. The other two operators Maju Express and City Holiday, both have strong presence in Southern Malaysia. City Holiday has the most trips from KL to Pasir Gudang, while Transnasional and Maju Express have 6 schedules and 5 schedules respectively. The estimated duration required for bus from Kuala Lumpur to Pasir Gudang is about 4.5 hours. With the VIP coach operating this route, passengers are so comfortable that they usually do not feel that long during the journey. The bus fare from Kuala Lumpur to Pasir Gudang is reasonably charged in the range of RM 36.10 to RM 37.40 depending on bus operators. Because all coaches in Malaysia do not install toilet facility in the bus, one stopover will be provided during the mid of the journey in highway resting area. Kindly take note that City Holiday coach will first stop at Masai Bus Terminal for passengers drop off before terminating in Pasir Gudang. With the hassle in buying ticket in advance over the counter in Terminal Bersepadu Selatan (TBS), it is always more convenient for passengers to book your ticket online in advance at BusOnlineTicket.com. Booking is instantly confirmed upon payment.